This technology is called textile organic light emitting electrochemical cells (OLECs). The OLECs are electrochemically stable in ambient air conditions and laid down as a thin film, they can produce light in the visible spectrum or in the ultraviolet (UV). The cells can work with a low voltage, but still provide a high level of luminescence. They are bright enough that the colours they produce can be seen in average daylight lighting levels and the emission of UV light allows fabrics to kill germs on their surface. The UV disinfection capability is called ultraviolet germicidal irradiation. UV OLECs can be printed onto bandages to give them antibacterial properties for medical applications to treat or prevent infection. The use of UV light to stop infections could reduce the reliance on antibiotics, the Southampton researchers believe. For the other areas, sports, cars, architecture and fashion, the OLEC technology offers the prospect of photochromic colour-changing textiles with the ability to change their colour very quickly with a diverse choice of colours. 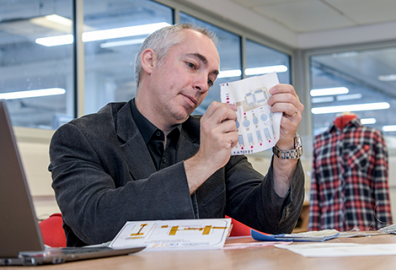 At the University of Southampton, the SEMS group, which is in the University’s electronics and computer science (ECS) section, and the synthesis, catalysis and flow group in the chemistry department are working together to research textiles that have electronics printed on them. 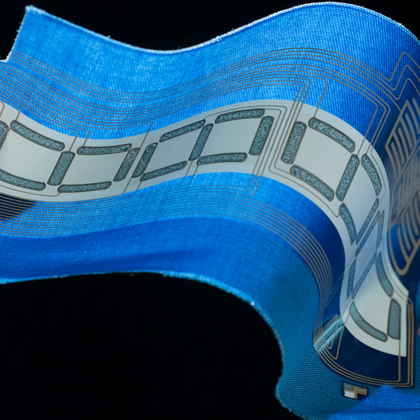 The SEMS group has managed two European Union electronic and sensing functionality in electronic textiles projects in the last nine years, with a total funding of 12 million euros. The current work is being funded by the UK government’s Engineering and Physical Sciences Research Council. Research elsewhere on colour changing battery powered fabrics has led to textiles that are linked to smartphones and wearer can change their clothes colours with an app. The University of Central Florida created a microwire that is weaved in with a textile that changes colour with heat. The heat comes from power from a rechargeable lithium ion battery. The microwires heat pigments in the textile and the pigments change colour. Different pigment strands can be heated to different temperatures to create patterns in the fabric.